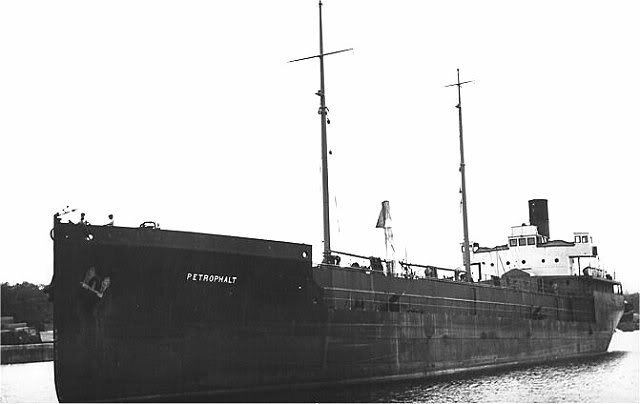 The Miramar Ship Index for "EBANO"
PETROPHALT(1933 -1952) -> ESSO LA MAILLERAYE (1952 -1953) F.N.N.U. 2623 g. 1472 n. 3096 d.; 91.30 oa-88.45 pp x 14.37 x 5.94 meters (4.95 draught). T.3 Cyl. steam engine of 229 NHP (1250cv) by the shipbuilder. 9 knots. 10.1930 : completed by Harland & Wolff, Ltd. (899), Belfast as EBANO for Ebano Oil Co, U.K.
1933 : purchased by Ste. Auxiliaire de Transports and renamed PETROPHALT. 1938 : owner restyled as Standard Française des Petroles. 06.1940 : Requisitionned in Falmouth by Ministry of War Transport (Anglo-American Oil Co. Ld.). 1945 : returned to French flag. 1952 : owner restyled as Esso-Standard SAF and renamed ESSO LA MAILLERAYE. 06.11.1953 : left Cherbourg in tow for breaking up at Aviles (Spain). 6.11.53 in tow (resold by French shipbreakers).